Historically, most houses were constructed as '100 mile' houses from caves, sod houses, log cabins and stone houses to the First Nations' indigenous cedar houses, tepees and igloos. People worldwide used whatever available materials were at hand to build shelters for themselves and their families. But is this possible in a modern 21st Century city like Vancouver? This competition will challenge all participants to rethink the way we live and select materials, systems and technology that reflect this reality in the world of computers, the internet, Facebook, etc... Participants are encouraged to challenge the logic of the present, formulate new questions, and explore variations that will allow new potentials for living. Geographically, we have selected the City of Vancouver to be the focus of the competition for the '100 Mile House'. 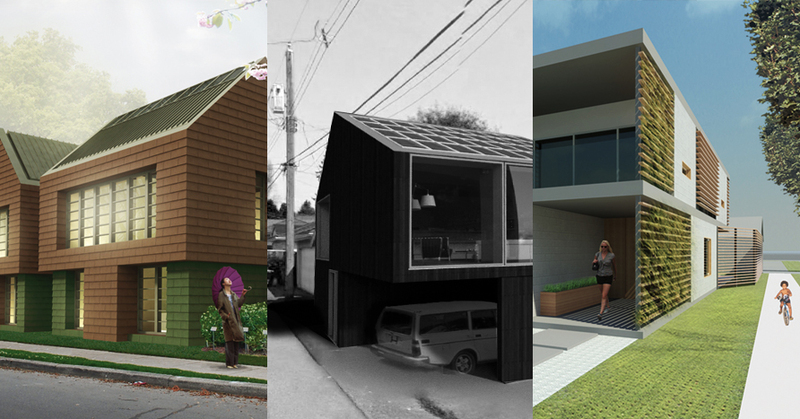 Participants are challenged to design a house to accommodate 4 people with a maximum area of 1200 square feet (111M2) using only materials and systems made/ manufactured / recycled within 100 miles of the City of Vancouver. A hypothetical flat, corner site of 33? X 120' (10.0 M X 36.6 M) will be used for the context. All city services (water, sewer, storm drain, natural gas and electricity) are available to the property line should the entrant choose to use them.